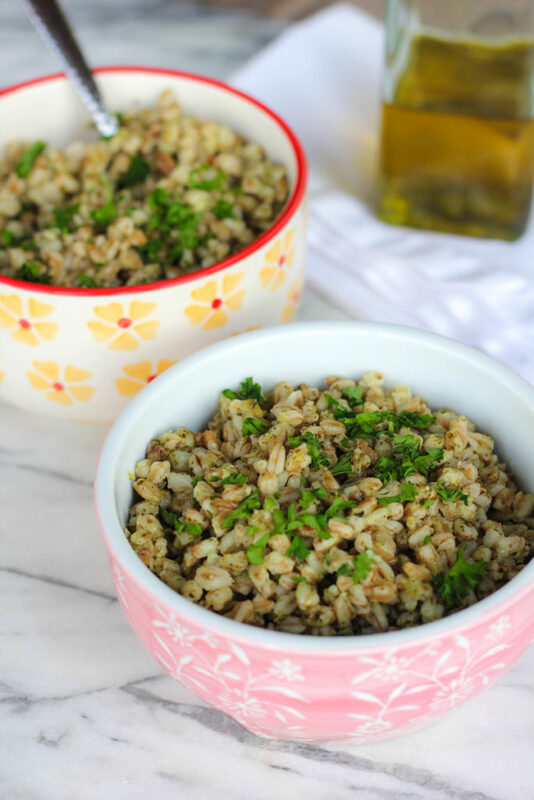 Not your typical leafy greens dish, this herb roasted farro salad recipe is still packed with plenty of nutrition! Although you can’t tell by looking, the recipe works in three whole cups of herbs (from mint and cilantro). Cooking with herbs is a super flavorful way to really give a significant phytonutrient and antioxidant boost to your recipes. Most recipes using fresh herbs as an ingredient call for maybe 2 or 3 tablespoons. I use a LOT more! But more herbs = more benefits! Cilantro: An incredibly nutrient-dense herb, 100 grams of cilantro yields a whopping 225% of the recommended daily intake for vitamin A, 258% of the DRI for vitamin K and 30% of the DRI for vitamin C. Cilantro also has numerous anti-inflammatory phytonutrient and antioxidant compounds. Mint: In addition to containing nutrients, mint is incredibly helpful for optimizing digestion. Mint stimulates digestive enzymes and helps convert food to usable energy. This delicious herb is also well known for enhancing energy and mood as well. I first got into eating farro after our trip to Italy last summer. Contrary to what many people may believe, Italian meals do not just consist of pizza and pasta 😉 In fact, I was rather surprised at how often we found farro on the menu when dining out in Italy. Anyway, when I first started cooking farro I cooked it like I do all of my other whole grains, in a rice cooker (Note: for what it is worth, VitaClay is the healthiest rice cooker on the planet; made with organic unglazed clay, VitaClay activates enzymes and minerals in your foods, enabling you to extract extra flavors and nutrients from your recipes while increasing digestibility.) 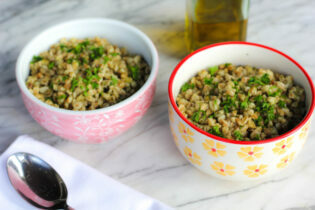 I still use my rice cooker to make farro, but I also found roasting it like I do in this recipe to be another super easy method. No pot watching! An ancient “old world grain”, farro is beginning to gain traction for its broad spectrum health and culinary benefits here in the States. A hearty and nutty tasting whole grain, it is especially rich in fiber. Farro contains significantly more fiber than other popular whole grains such as brown rice or even quinoa. It is also exceptionally high in protein for a grain. Rich in B vitamins, zinc and iron, farro supplies more than ten different vitamins and minerals as well as antioxidants and phytonutrients. No. Farro does contain gluten, but it contains lower levels than today’s wheat. 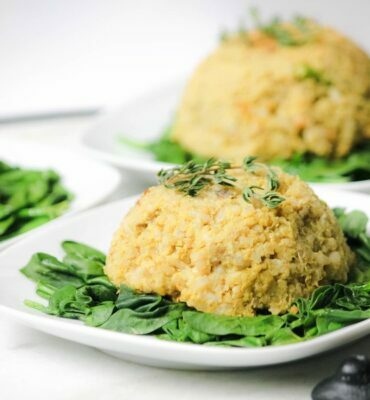 Although a good number of people with gluten sensitivity are still able to tolerate gluten-containing ancient whole grains such as farro, those with celiac disease should not eat it. All foods containing gluten have the potential to cause villous atrophy in those with celiac disease. 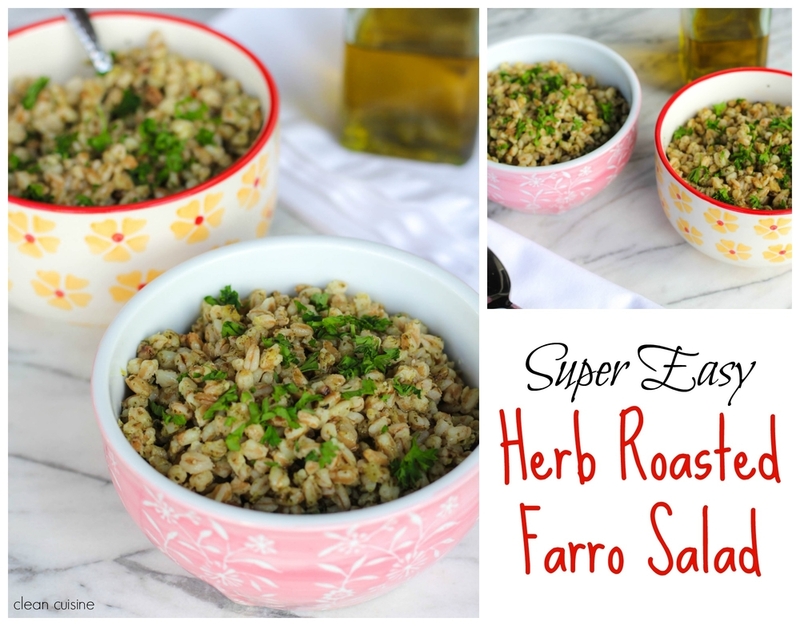 This herb roasted farro salad recipe is packed with flavor and incredibly easy to make. It’s also loaded with fiber, antioxidants and phytonutrients. To a high speed blender (such as aVitamix), add 1/3 cup of the olive oil, cilantro, mint, 6 cloves garlic, shallots and salt; process into a smooth and creamy sauce. Set herb sauce aside. Heat the remaining 3 tablespoons of olive oil in a saucepan over medium heat. Stir in the farro. Finely chop the remaining 2 cloves of garlic and add to the farro. Add the lemon zest. Stir-fry the farro mixture for 4 o 5 minutes, coating the farro with the oil. Add the reserved herb sauce to the saucepan along with 6 cups of water. Bring mixture to a boil. Cover and transfer to the oven. 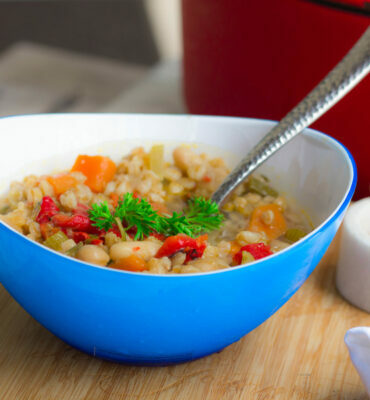 Bake for 45 to 55 minutes, or until liquid is absorbed and farro is tender. Serve warm or cold. If you liked the Farro Salad recipe, be sure to check out a full month’s menu of delicious healthy dinner recipes (including weekly shopping lists!) 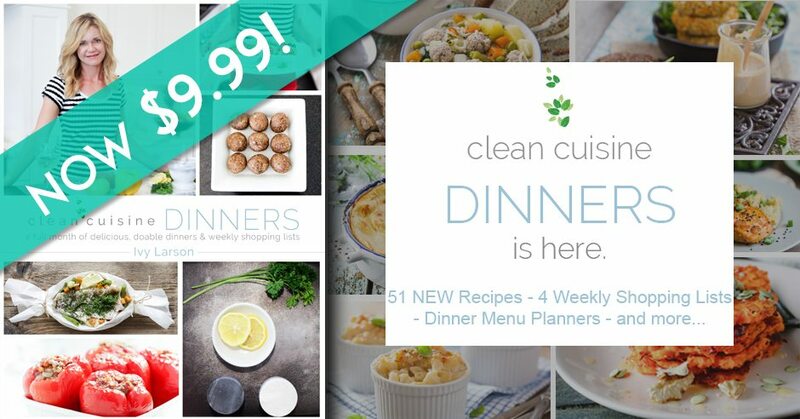 in our Clean Cuisine Dinners digital cookbook.